Adventures in the Endless Pursuit of Entertainment: What does a Diva wear when she wants to Rule the World? What does a Diva wear when she wants to Rule the World? 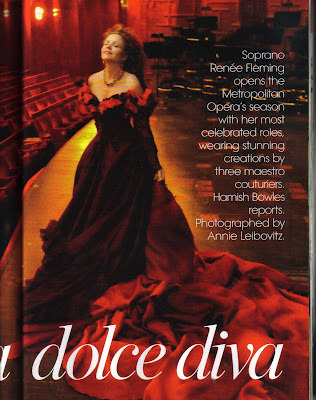 On Monday night, Renée Fleming is the first woman and only the third single performer to open the season of the Metropolitan Opera. She'll be wearing haute couture designed especially for the evening. The first gown is by Christian Lacroix for Violetta in the third act of Verdi's La Traviata. 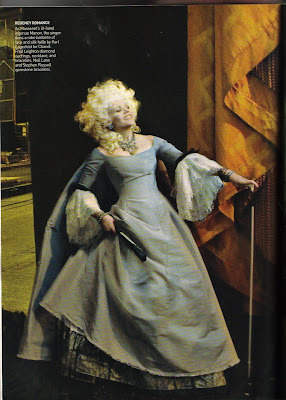 The second gown is by Karl Lagerfeld (for Chanel) for Manon in the third act of Massenet's Manon. The last gown is by John Galliano (for Christian Dior) for the final act of Capriccio. Of course, La Diva Renée won't be alone on the stage as it wouldn't be a night at the opera without Opera Hunks - tenor Ramón Vargas, baritones Thomas Hampson and Dwayne Croft, and bass Robert Lloyd all join her on stage. The bonus is Susan Graham is hostess of the evening. I won't be in the house but watching close-ups in HD at the Chelsea Clearview. These photos are by Annie Liebovitz for Vogue and appear in the American October issue. Fittings were done late spring in Paris and the photos were taken at the Met in New York City. Hair is by Tom Watson, wig master extraordinaire at the Met and around Broadway. that capriccio shot is STUNNING. 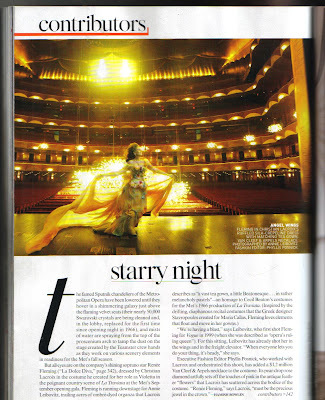 Thanks for scanning and sharing these--I quickly thumbed through the current Vogue yesterday without spotting them. I love the Traviata gown but ADORE the Capriccio. Actually, the photos were taken not in Paris but at the Met -- the auditorium and the gold curtain are recognizable even if the magazine copy didn't say so.